I read a story in the morning paper last week that changed my life. Well, at least for a few hours. At first I was amused by it. Then, I was incredulous. When I got to the end, all I could think about was what I had just read. Suddenly, I couldn’t get enough of the subject of … mannequins. That’s right, me — dizzy over dolls! I never saw it coming, I swear. 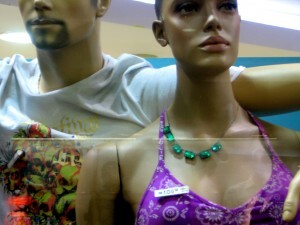 The headline was intriguing: “Mannequins get real ”. But it was the first paragraph that really pulled me in. I read about mannequins in Miami with flower tattoos, mannequins in New York with “pubic hair peeking through their lingerie”. And mannequins at David’s Bridal that would soon be getting “thicker waists, saggier breasts and … back fat”! Who wouldn’t read on? The story had other tempting tidbits about mannequins, too, which — if I were trapped in Macy’s for a decade — would never have occurred to me. Like, how much mannequins cost. “White, headless, no-arms-or-legs torsos: $300; More realistic-looking ones: up to $1,500.” Shut the front door! What dummy would ever pay that for plastic body parts? When I finished the article, I felt compelled to learn more. I googled, “mannequin” and spent the next three hours poring over everything on the World Wide Web from “crash-car dummies” to a 1987 film about an artist who made a mannequin so perfect, he fell in love with it. Before long, I was actually viewing specs for “Used Dress Forms”, on-sale at a business surplus place five miles down the road. I pulled the laptop closed. Even my fascination has limits.